Since Sea Shepherd embarked on its first whale defense campaign, over 6000 whales have been saved from Japan’s deadly harpoons. 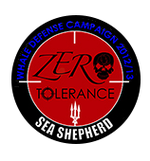 Sea Shepherd's fleet in the Southern Ocean for Operation Zero Tolerance, 2012/2013. Photo by Sea Shepherd. The whaling fleet was located on December 22 and fled from their chase. On Christmas Day, the Japanese factory ship, the Nisshin Maru, was intercepted and fled from the Farley Mowat as a result. 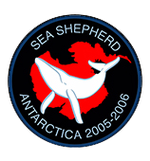 2005/2006 Antarctic Whale Defense Campaign. Photos Sea Shepherd. The first Antarctic Whale Defense Campaign to involve two ships, the M/V Farley Mowat, and the M/Y Robert Hunter, a Hughes 300 helicopter (called the Kookaburra). 56 crew members represented 14 different countries. The Japanese whaling fleet set out to kill 935 Minke whales and 50 Fin whales, but Sea Shepherd gave chase for five weeks and for thousands of nautical miles. 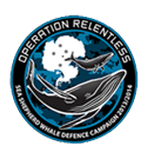 The fleet was intercepted on February 9 and February 12, which severely disrupted operations and saved the lives of hundreds of whales. 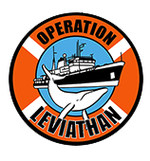 Operation Leviathan 2006/2007. Photos by Sea Shepherd. 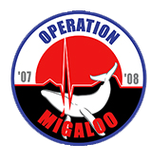 Operation Migaloo 2007/2008. Photos by Sea Shepherd. Operation Musahsi, 2008/2009. Photos by Sea Shepherd. For three weeks straight, not a single whale was killed. Operation Waltzing Matilda saved the lives of 528 whales and cost the Japanese government tens of millions of dollars. 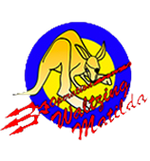 Operation Waltzing Matilda, 2009/2010. Photos by Sea Shepherd. We sailed three vessels for Operation No Compromise, the M/Y Steve Irwin, the M/Y Bob Barker, and the newest vessel to the fleet, The Gojira. Our interventions forced the Japanese whaling fleet to suspend their operations and leave the Southern Ocean early, directly saving 863 whales. 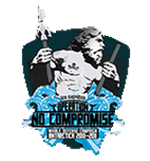 Operation No Compromise, 2010/2011. Photos by Sea Shepherd. During Operation Divine Wind, Sea Shepherd’s eighth Antarctic Whale Defense Campaign, the Brigitte Bardot, Sea Shepherd’s newest vessel, was damaged when a rogue wave hit the pontoon and was forced to return to port early for repairs. 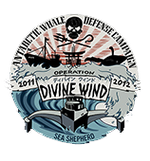 Operation Divine Wind, 2011/2012. Photos by Sea Shepherd. The Japanese whalers escalated their attacks on our crew and three of our ships were damaged after being rammed multiple times by the 8,000-ton Nisshin Maru. Our crew also endured ongoing attacks by concussion grenades and were hit with high-powered water cannons. Operation Zero Tolerance, 2012/2013. Photos by Sea Shepherd. Operation Relentless, 2013/2014. Photos by Sea Shepherd. Our flagship vessel, the M/Y Steve Irwin, with Captain Wyanda Lublink and 35 crew from six countries was joined by our newest patrol vessel, M/Y Ocean Warrior, with Captain Adam Meyerson and 14 crew from eight countries, to once again stop the Japanese whaling fleet from illegally slaughtering whales in an internationally-recognized whale sanctuary under the guise of “scientific research”. The Japanese whaling fleet took three solid months to kill 333 whales. 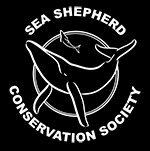 This averages out to 111 whales killed per month compared to 345 whales killed per month prior to Sea Shepherd’s involvement. Read more about Operation Nemesis here. 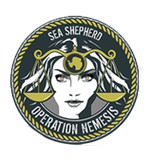 Operation Nemesis, 2016/2017. Photos by Sea Shepherd.